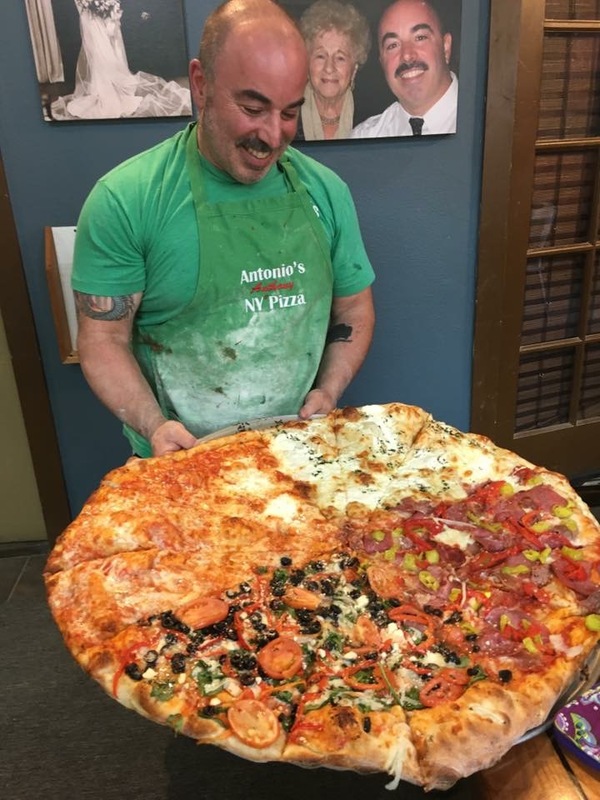 Home › Antonio’s Real New York Pizza Menu › Hell’s Kitchen – The Pizza! The Hell’s Kitchen Pizza: 12lbs of ridiculously delicious fun. 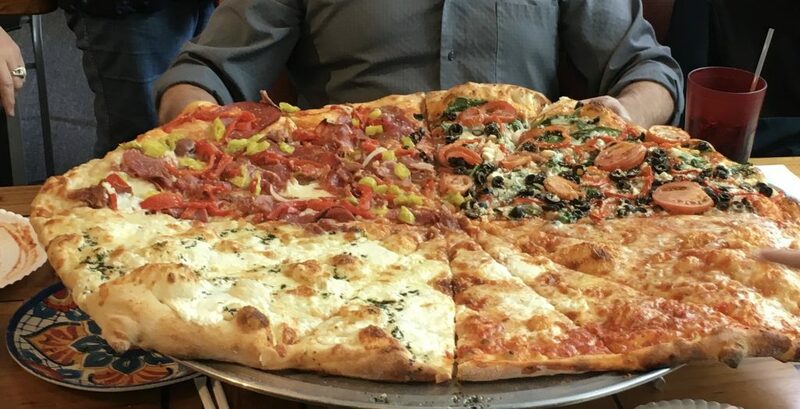 Each Quadrant is one of our specialty pies: 1/4 Godfather, 1/4 Greek, 1/4 White Garlic, 1/4 Cheese pie. Literally 12 pounds! 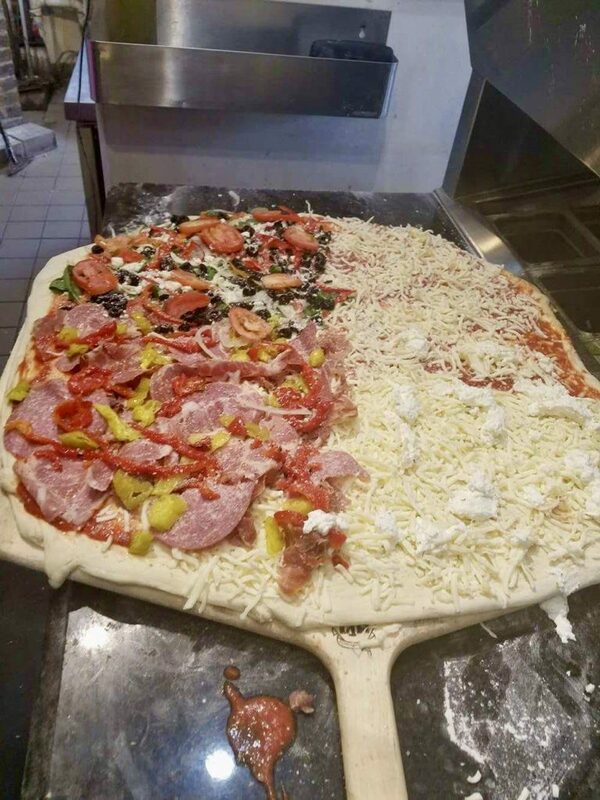 We start with a 5lb dough and make something incredible: a thick-crust behemoth. The dining room goes nuts when these come out. There is a great story behind naming this beast. As a teenager back in the early 80’s we would often visit Hell’s Kitchen in NYC where my aunts – who were sisters and rather beautiful – were dating the heads of competing motorcycle clubs which shall remain nameless. These guys were both in the apartment and my aunt happened to have two rottweilers, a male and a female. They loved us but the female bit my mother in the behind pretty hard when she startled her. We had been there for a few hours, so it was time to call it a day. This after being show tricks involving a glass eyeball…. It was one hell of a day. Well, we get downstairs and go to start the 1968 Oldsmobile we drove into NYC and nothing, not even a click. The day was about to get even more memorable. We open the hood and the battery is gone. The guys upstairs start making phone calls and as if by magic, the battery returns. So, when I was trying to come up with a name for this outrageous of a pizza, it had to be symbolic. Hell’s Kitchen popped into my head along with this fateful day, and so it was named and shall be! The Hell’s Kitchen Pizza: 12lbs of ridiculously delicious fun. 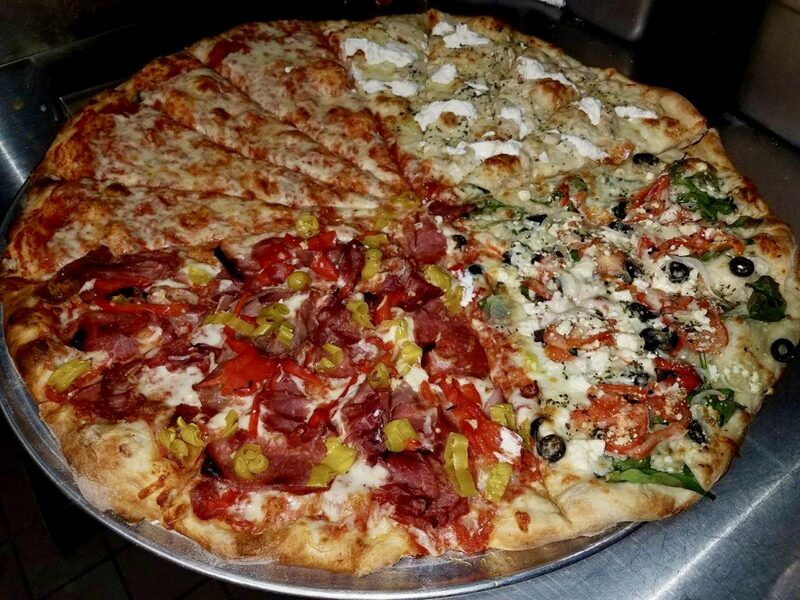 Each Quadrant is one of our specialty pies: 1/4 Godfather, 1/4 Greek, 1/4 White Garlic, 1/4 Cheese pie. Literally 12 pounds! This guy is 6′ 3″ which gives you an idea of the size of this thing! The Hell’s Kitchen on the board about to be fired. That board weighs 17 lbs with the pie on it! The table in this photo is 30″ wide. 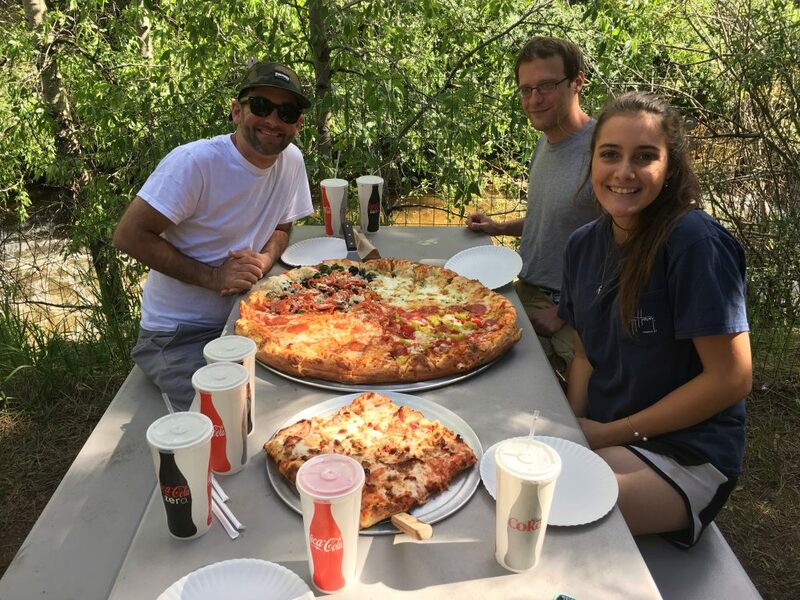 The Sicilian pizza in the foreground is 12″x12″. Look how thick the Hell’s Kitchen is in comparison.